You’ve made the choice to buy organic food, but have you thought about the pots and pans you’re putting it in? Editor&apos;s Note: Help us deliver more content and less ads! Our team of researchers and writers spend thousands of hours researching and vetting products that help you lead a natural and thoughtful life. You support our work by using the independently chosen links in this guide, which earn us a commission. 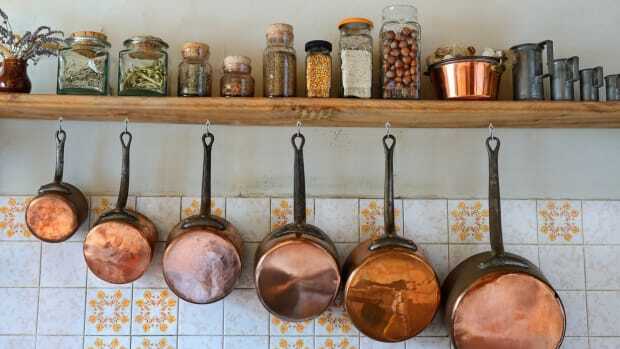 You&apos;ve decided to eat clean and buy organic food, but it’s just as important to choose green, non-toxic cookware to ensure that you’re keeping your family safe. This is of the utmost importance when it comes to nonstick cookware, which is generally made using poly- and perfluoroalkyl substances (PFAS). These substances release perfluorooctanoic acid (PFOA), a carcinogenic chemical when heated. In addition, many of them contain dangerous heavy metals that can flake off during cooking and into your food. But there are other reasons to choose green or eco-conscious cookware as well. 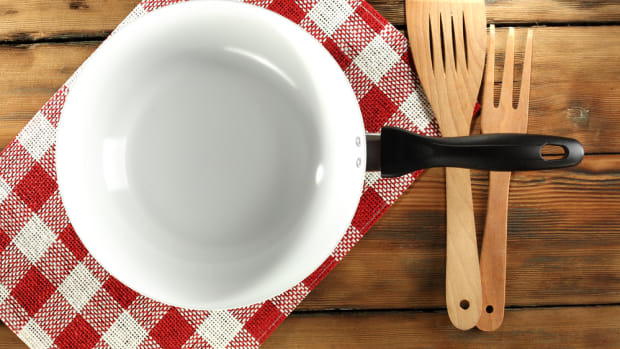 When you&apos;re buying pots and pans, whenever possible, choose items made from safe, non-toxic materials like carbon steel, ceramic, lava rock, porcelain enamel, or tempered glass. 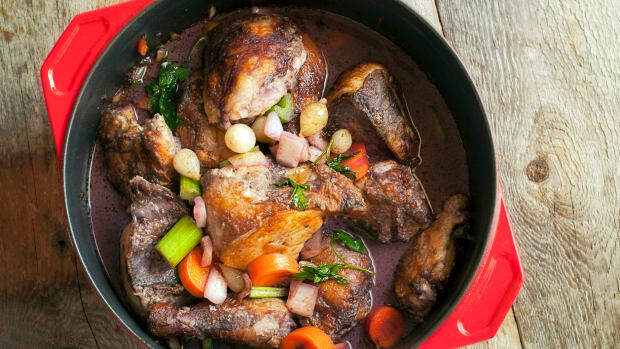 Cast iron and stainless steel are generally okay, though they too can leach heavy metals – iron and nickel respectively – into your food, so it&apos;s generally a good idea to stick to other materials for long-simmering dishes or recipes that contain a lot of acid, such as tomato-based foods. There are two materials, however, that you should avoid whenever possible: aluminum and Teflon. There&apos;s been quite a bit of research linking elevated aluminum levels to central nervous system problems, including one 2013 study in Immunologic Research that linked aluminum to Alzheimer&apos;s, ALS, and autism spectrum disorders. As for the latter, it&apos;s the material used in most nonstick cookware, but studies have shown that the polytetrafluoroethylene (PTFE) coating on the pans turns into toxic Perfluorooctanoic acid (PFOA) at high heat, making it dangerous both for the cook and for diners. In fact, award-winning filmmakers Morgan Spurlock and Stephanie Soechtig have teamed up to take on the chemical with a new documentary featuring activist Erin Brockovich: "The Devil We Know". Here are nine of our favorite non-toxic cookware brands to try. 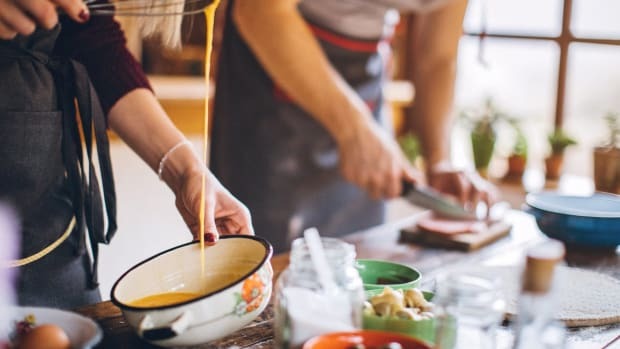 The issue, of course, is that nonstick cookware can be useful: whether you&apos;re frying an egg or making crêpes, sometimes you want a surface that doesn&apos;t need heaps of fat to release your food. 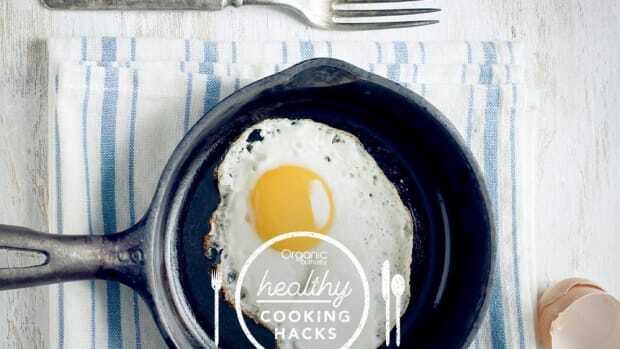 And that&apos;s where non-toxic, nonstick cookware comes in handy. This German cookware company known for its knives also makes ceramic nonstick cookware that stands the test of time. A review on CenturyLife.org noted that Zwilling&apos;s Ceraforce Ultra-coated cookware is easy to clean and use and more durable than traditional nonstick pans, making it worth the higher price tag than some others on this list. 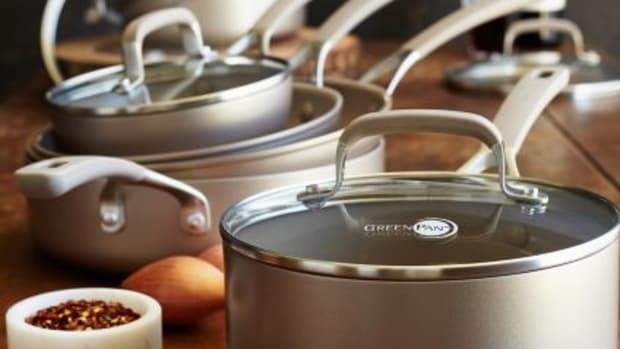 GreenPan is a higher-end Belgian brand that makes nonstick, non-toxic cookware coated with Thermolon – a ceramic nonstick layer derived from sand. 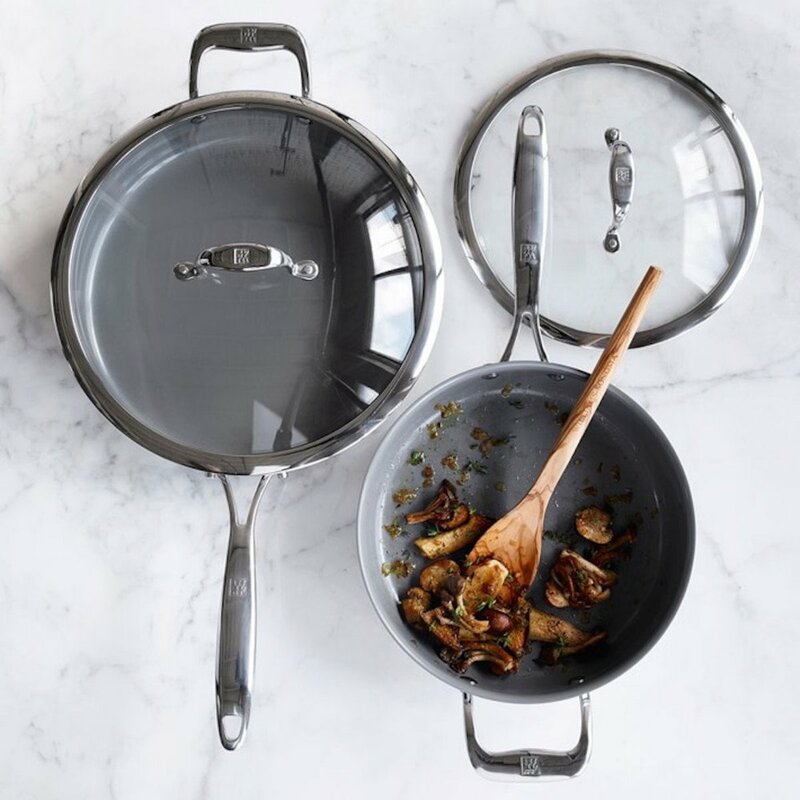 It contains no lead, cadmium, PFAS, or PFOA, like other nonstick pans can, and it is heat resistant up to 450°C, meaning that it won’t blister or release toxic fumes when overheated. The company has also taken strides to make its production methods as green as possible, emitting 60 percent less CO2 during the curing phase of the nonstick coating as compared to traditional coating. With ten years of experience, GreenPan has sought to improve its nonstick coating again and again. Its Valencia pan, available on Amazon, is one of its most advanced yet! 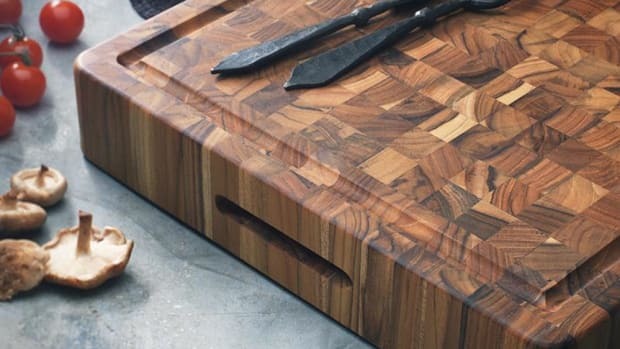 The company also recently launched its newest line, Craft, in partnership with Sur La Table. Boasting skillets, saucepans, pots, and more, this new line exclusive to Sur La Table is specially designed for durability and efficiency on induction stovetops and boasts up to 40 percent more cooking space than other brands. 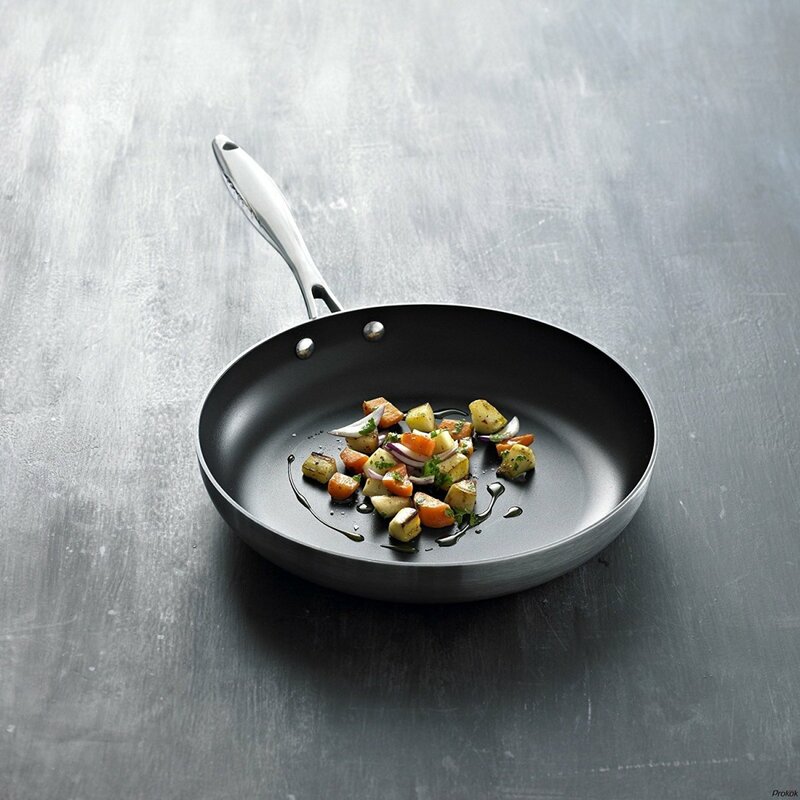 Unlike many other nonstick cookware options, Cuisinart&apos;s Green Gourmet line uses a ceramic-based nonstick surface called Ceramica. The coating is free of PTFE and PFOA. But that&apos;s not the only way that this cookware is helping you save the planet. It is designed to achieve better heat conductivity than other nonstick pans, helping you save energy as you cook, and recycled materials are used whenever possible, for example in the stainless steel handles of the cookware and in the packaging. 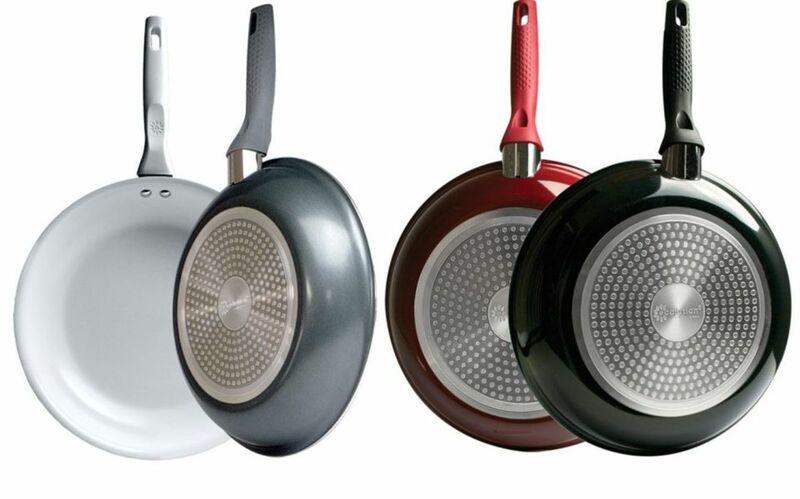 Danish Scanpan is made with a Green Tek nonstick surface – a proprietary ceramic titanium coating that&apos;s not only scratch-resistant, it&apos;s free of PFOA and PFOS. The pans are made with recycled pressure-cast aluminum for better heat distribution and retention than many other aluminum pans. Ozeri’s Green Earth pans are coated with a German nonstick coating called Greblon, free of both PFOA and PTFE. This time-tested coating is ceramic based, scratch-resistant, and safe to cook with. In addition to these lime green pans, Ozeri also produces a line of Stone Earth pans made with a chemical-free stone-derived nonstick coating. Ozeri offers pans that have either a smooth or a honeycomb textured cooking surface; the latter allows small air pockets to develop beneath the food, helping it to adhere even less to the cooking surface. Safe at temperatures up to 480 F, these pans are easy to use in the kitchen, no matter what sort of range you have – gas, electric, or induction. Beka makes a specific line of eco-logic cookware with a non-toxic nonstick coating that’s not only kitchen-safe, it’s environmentally friendly. Beka adds a green Eco-logic by Beka logo to all of its products that ascribe to these tenants, to make them easy to identify in stores. This wide range of products includes skillets, frying pans, and woks, but also tools like ladles, skimmers, spatulas and colanders. These products are made of a combination of bamboo powder and other natural biodegradable materials. GreenLife nonstick cookware is coated with Thermolon, which is more durable and safer to use at high heat than Teflon, not to mention safer to clean (occasionally!) with mild abrasives like baking soda. Free of lead, cadmium, PFOA, and PTFE, this cookware is much safer to cook with, both for the cook (it doesn&apos;t release toxic gases at high temperatures like Teflon does) and for the diner than traditional nonstick. 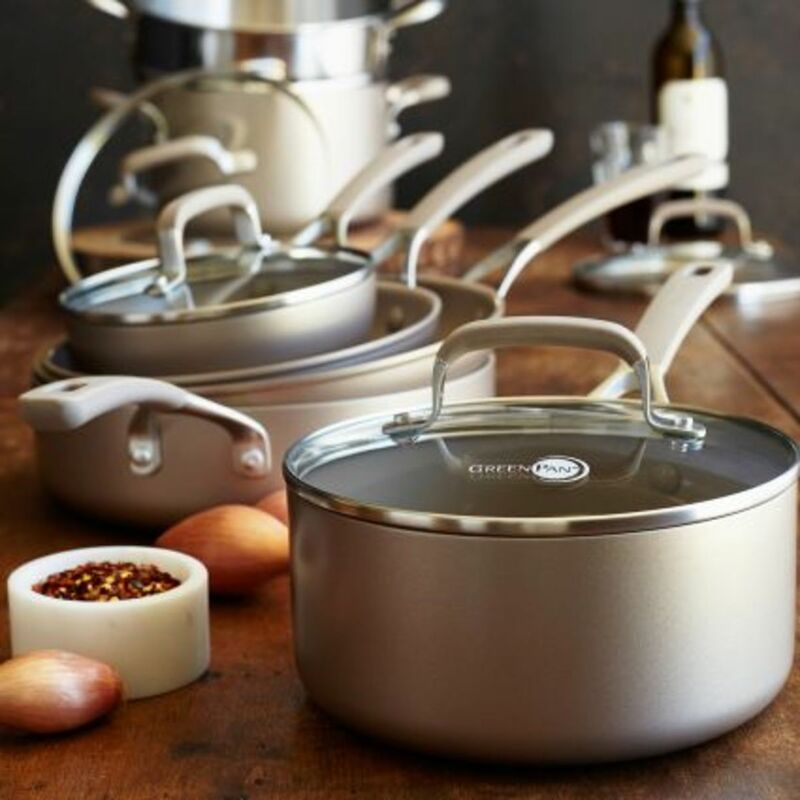 Ecolution lives up to its brand name with its Bliss line of non-toxic, nonstick cookware. This line features a durable, water-based ceramic coating that&apos;s PFOA and PTFE-free. It&apos;s also versatile: it can be used on induction ranges as well as gas and electric, and it&apos;s available in four colors – black, white, grey, and red – to suit your kitchen style. We also love the other eco-conscious nods made by this brand, including printing its packaging on 70 percent recycled material. 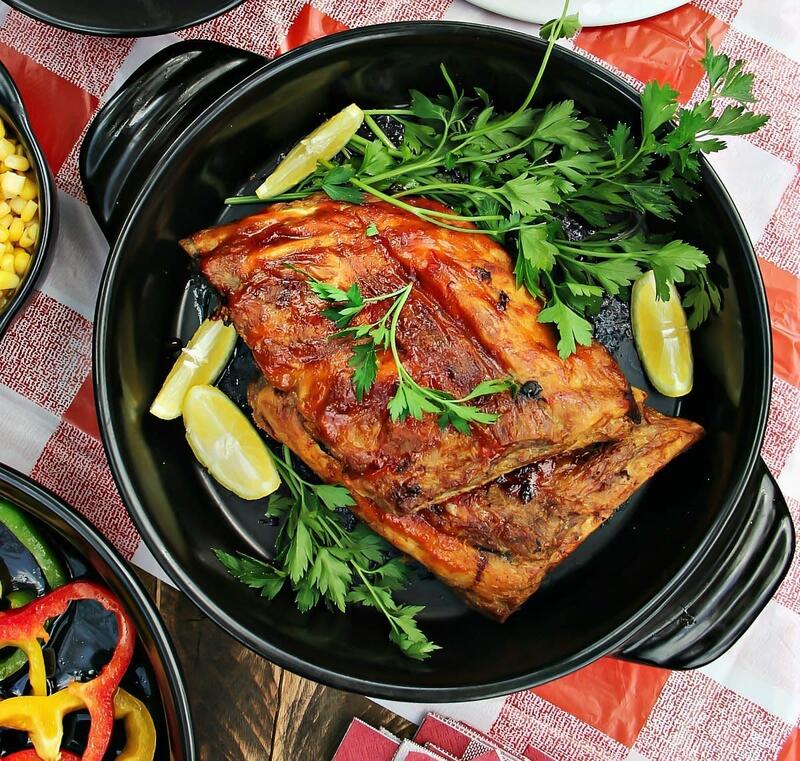 The ceramic cookware from Xtrema is California Prop 65 tested and approved, and each shipment is further tested for the presence of heavy metals. Eco-friendly and safe to use in the microwave, dishwasher, oven, and stovetop, this cookware is a great, non-toxic non-stick choice. 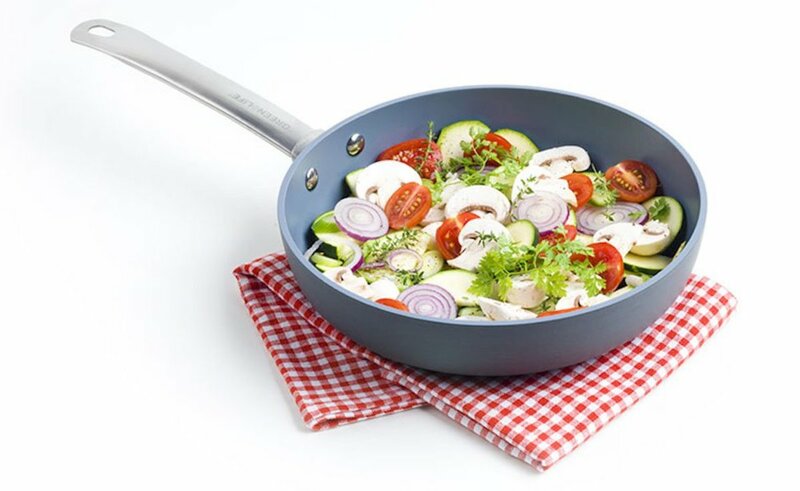 While Xtrema is not the ideal cookware to use over high heats and requires care when handling while hot due to its sensitivity to sudden drops in temperature, this cookware is quite durable and boasts a non-scratch surface perfect for cooking even foods that tend to stick to the pan, like delicate fish or eggs. 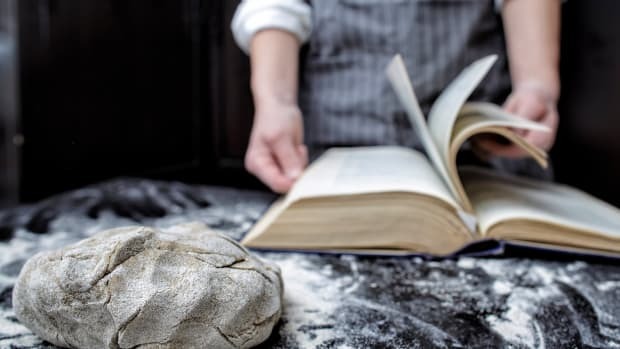 Stone, Steel, or Cast-Iron: Which is Best for Homemade Pizza?